It's time for Trendy Tuesday again!! So glad to have you here. And SO excited about tomorrow!! Anyone else have some fun 4th of July plans? I think we are going to the lake...SO MUCH FUN! Fireworks, and sunshine, and flags, oh my!! I can't wait!! Hope you have had a chance to check out my fun Mason Jar centerpiece. I had so much fun making it. It turned out so bright and festive. And I LOVE the festive things that you have been making. Here they are, all bright and glorious! 1. 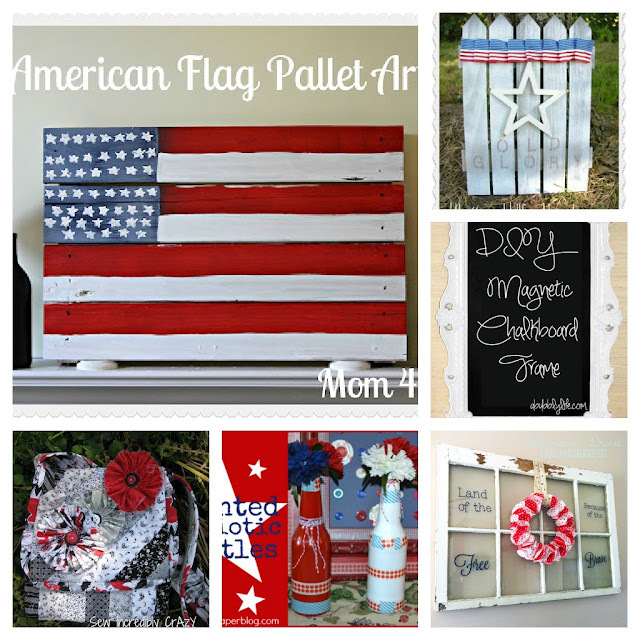 American Flag Pallet Art from Mom for Real....LOVE this! 2. Old Glory Picket Fence from Silo Hill Farm. SO darling! 3. DIY Magnetic Chalkboard Frame from A Bubbly Life! Adorable! 4. Patriotic Cupcake Wreath from Atkinson Drive So creative! 5. Painted Patriotic Bottles from Itsy Bitsy Paper I adore these! 6. Messenger Bag from Sew Incredibly Crazy This is lovely! Sara, thanks for hosting... have a nice day! Thanks for featuring my Old Glory Picket Fence! Thank you for inviting me to the lovely party! Thank you so much for the invite, what a great linky party!